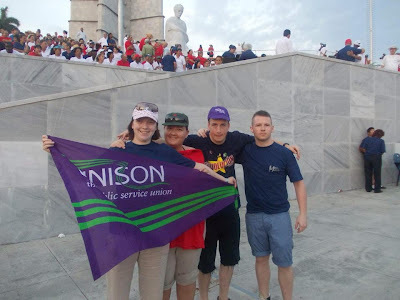 I was over the moon when I got accepted to join the NW UNISON delegation on the Young Trade Unionist May Day Brigade to Cuba. This was the 6th time that the Cuba Solidarity Campaign organised two weeks of solidarity and celebration of the Cuban Revolution. 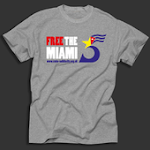 The campaign seeks an end to the 50 year blockade of Cuba. The United States Government has for 50 years blocked trade with Cuba. It is not just an embargo; America also blocks third countries from trading with Cuba. We took part in different activities while in Cuba. One of them was farming. We spent a whole day piling up branches into a bonfire and another day moving large stones. It was very exhausting, physically and mentally. At the end of both days I thought “What is the point, I’m a council gardener and this would take an hour with a John Deere tractor”. With 30 operatives and no tractor it took all day. If we had a tractor time would fly by very swiftly. That is just the point, Cuba struggles to make new vehicles or import them because of the blockade. Most cars and lorries are 1950s American vehicles. The Cubans have done very well in maintaining these vehicles for so long. This may be because Cuba has active mines. They have large deposits of nickel and nickel cobalt. Another major industry is the health care industry. The Cuban health service trains doctors and nurses that go and work all over Latin America. Cuba regularly sends medical aid missions to tropical islands along the Equator and in South America whenever there is a natural disaster. Cuba has a lot to give. Cuba may not have the oil or wealth of the United States of America but it has a heart for the poor; which is exactly what the capitalist countries elsewhere do not have. What Cuba has, it shares generously. What became apparent at the May Day rally in Revolution Square is that all of the doctors, consultants, nurses, military forces, local government workers, school teachers and children were marching together. The atmosphere was amazing with all of the music, the banners and the revolutionary cheer. We attended a play which was performed by the school children. 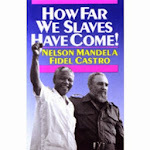 It was about the Spanish-American War right through to the Cuban Revolution. A few days later we attended a street party with a local Committee for the Defence of the Revolution. From the age of 5 to 75; everyone in Cuba loves to dance. In the street party there was a 5 year old boy who was busting some moves. Everyone was dancing. The President of the local Communist Party addressed the delegation at the end of the night and thanked us all for being there and for showing solidarity with the Cuban people. If any young members are thinking of going next year don’t go for the food: the food is poor. Take plenty of mosquito spray; take a torch and a rain coat. It rained once while I was in Cuba; at that time we had a thunderstorm and a power cut. Take working boots, gloves and washing powder. I would recommend going on a Brigade in Cuba to anyone, whatever age you are. There are Brigades for people of any age as well. Get involved -become an activist!